There no accessories more important to a door than its handle and lock. This can be seen throughout history as handle styles change and lock technology improves. For example, the ornate crystal handles from last century were once the height of class and refinement, but now are often only seen in specialty situations. Popular finishes for door locks and hardware from the last few decades are brass and gold, but are these styles going the way of crystal? Schlage, a forerunner in door locks, is very interested in this question and is ready to provide just what the public wants in terms of door styles. There are several reasons that chic homeowners are turning away from brass and other metal finishes, but the main reason is that highly polished and reflective metals look old fashioned and gaudy. This does not mean that all metal surfaces do not have a place in the home, but designers do need to be a little more selective if they wish to choose hardware that will stand the test of time. Choose brushed rather than polished metal – A brushed metallic surface is an excellent choice that fits with almost any other aspect of home design. It still looks great but it is a little less flashy and noticeable compared to polished gold or brass. Small accents make big impressions – Consider placing a brass lock or knob on exterior doors only since there is no need to make every door match. A few brass touches can be very effective without causing a house to look dated. Consider re-sell value – Even people who love highly polished brass may want to consider replacing their locks and door knobs, especially if they plan on selling their home. Obviously out-of-style aspects of a home could turn people off or even lower the home’s value. Explore other finishes – Brass and gold are not the only metal door hardware options available; copper and chrome are likely to make waves in the world of door accents in the next coming years. The debate still continues, and anyone can chime in on Schlage’s Facebook page and maybe even help decide the future of upcoming door handle finishes. Although door handles may be a small aspect of a home’s décor, they are tools that most people come in contact with every day. For this reason, picking a style of handle that you will love for the next decade is important. Schlage has been in the business of providing the most attractive and secure door locks possible for 90 years. 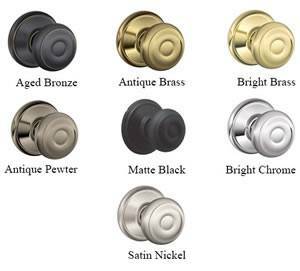 Check out all of the options available from Schlage to get great decorating ideas and consider for yourself whether to keep with past tradition and choose a brass finish, or to experiment with a new look for your home. New Schlage locks installation is preferred by many home builders, and high quality Schlage products are great addition to remodels and retrofits. With more than 1,000 different custom options, Schlage can help you design the lock and handle that will perfectly complement your home. Great Valley Lockshop is an authorized Schlage Factory Distributor and can help you choose the perfect lock for your home. Not only do we sell Schlage locks, we also install and service them. We are the Philadelphia area’s complete source for Schlage locks. Thinking about upgrading the locks in your home or business? Call us at (610) 644-5334 or message us using our online form and we will help you get started today!